of the hill station in the Indian state of Tamil Nadu. This hill beauty is gratified with unanimous scenic beauty, emerald valleys and mysterious mountains which make it among the top honeymooning and vacationing destination of India. 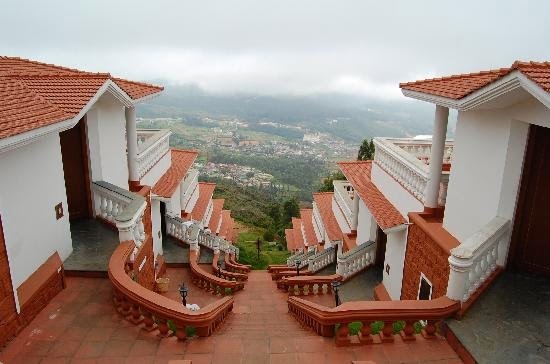 Doddabetta Peak: Nestled at an elevation of 2, 623 meters, Doddabetta Peak placed 10 km away from Ooty is one of the major attractions for tourist. On a clear sunny day which is honestly not often here in this place, visitors can enjoy sumptuous view of the valley down including flat high lands of Mysore and plains of Coimbatore owing to its elevation which is the highest in the district of Nilgiri. You can witness the amazing views by using a telescope which is run by the Tamil Nadu Tourism development Corporation. Trekking is the only way to reach the peak and is of moderate level. Make sure to carry a camera to click astonishing sights of nature. Botanical Gardens: Extended over an area of 22 hectares on the hill slopes with the highest elevation accounted at 2, 400 meters above sea level, Botanical gardens houses an explicit collection of flowers including rare coloured lilies, beautiful shrubs, flowering trees and many more. The foundation stone for this garden was laid out by Marquis of Tweedale in 1847 and presently it is maintained by Horticulture Department of Tamil Nadu. The prime attraction of this garden include monkey’s puzzle tree in which monkey can’t climb, 20 million year old Fossil tree, fern house with very rare ferns and orchids, a crystal clear pool, and an Italian garden bordered by immense variety of flowering plants. Summer Festival held during the month of May exhibits varies rare flowers and other species of flowering plants attracting hordes of travelers and nature lovers from across the globe. Ooty Lake: Center of tourist attraction in Ooty, Ooty Lake is an artificial lake constructed by John Sullivan in 1824 spread over an area of 65 acres. Visitors can relish boating while viewing the majestic sights in and around the lake. During summers, the lake hosts boating competitions and other pageant. The lake acts as a pearl of this hill beauty and adds a real spice to the tourism industry of this place. Hindustan Photo Films: Placed 5 km away from the railway station of Ooty, it is one of the prime industrial units of Ooty and produces Indu X-ray films which is considered among the best quality in the entire globe. It was inaugurated by first lady prime minister of India, Late Mrs. Indira Gandhi in 1967. 6th Mile and 9th Mile: Renowned as shooting spots of Indian films, 6th Mile and 9th Mile are placed at an expanse of 6th mile and 9th mile respectively from the main town of Ooty. The verdant green pastures surrounded by the green carpeted mountains of these places have been used in partial scenes for many Bollywood and Tollywood movies. The serene ambience and emerald greenery combined with the luscious views makes it ideal for spending couple hours of time with family or with your loving partner. Rose Garden: Home to over 2800 species of roses, Rose Garden is extended over an area of 4 hectares and is one of the most significant gardens in South Asia owing to its vast collection of roses. It is located at a walking distance from the city main point. Pykara Lake, Avalanche, Emerald Lake, Glen Morgan and Kalhatty Waterfalls are some other places of tourist interest in Ooty. some of the best hotels in Cochin.